In this episode: A successful photo shoot in Tenby (see sneak peek at left! ), plus lessons in gratitude, gratefully received, cover in melted cheese, served with lime wedges and a sprinkling of toasted platitudes. On the needles, the Dwarven Battle Bonnet, more recipe than pattern, but highly recommended for the Middle Earthers on your Yule list. I’m knitting mine in New Lanark Mill Aran. Special thanks to Felix for the amazing Sounds of Wool, and for compiling all the links below for the Episode 104 Sound Diary. Rosie talking about the sound of wool fibres. Rachel talking about how quiet wool is. Julia Desch and Felix tending the sheep with a sore hoof. The sheep is baaing! A ewe calling for her ram-lamb and Julia talking about her intelligent Wensleydales. Rachael Matthews and Felix talking about counting stitches. Recorded at Prick Your Finger during the KNITSONIK residency. Music by Adrienne Pierce, Joy is Within Reach. Thanks for a lovely half hour of relaxing knitting. Loved having the theme tune back – I had noticed its absence for the last few podcasts. Great piece on the sounds of wool from Felix. Really interesting perspective. Hope you have a lovely weekend and enjoy your roast chicken and pumpkin pie. Love the theme song and glad to have it back. Hope your Thanksgiving by another name is all you hoped it would be. We’re off to stalk the traditional Thanksgiving pizza (family custom, inviolable). Brenda Brenda Brenda Brenda Brennnnndaaaaaa! Am SO happy to see you back! It took me a couple of months because I so rarely check my podcasts, but unbeknownst to me, my itunes was happily downloading them in the background. It’s wonderful to hear your voice again. Hello Brenda, I am so happy that the theme song is back. I especially missed the sheep! Warm greetings from a long time listener in Australia. Yes, please keep the theme song! I missed it when it was gone – your podcast just wasn’t the same without. Love hearing your voice every week! Ah, Brenda, you made my day with the return of the theme music. And the sounds of the world of knitting were great. I wish I’d had the quiet time on Thanksgiving itself to listen to the podcast — I could’ve used the stress relief. Yay! The theme song is back!!! Thank you Felix for the wonderful sounds of knitting! Hey Felix, the Thursday roast chicken was awesome. Brenda made the cranberry relish with the un-finished sloe gin. Very perky. You lot are all going to have to ask Brenda for the recipe. Brenda is going to let me début the beardy hat to work on Monday. All the guys in the office have busily been Movembering and discussing what ‘manscaping’ they were going to carry out over the weekend for their final facial display on Monday. I have put up with a month of chin stroking and talk about their manly chins. This might give me the last laugh! I’m so looking forward to the next installment of Welsh for Rainbow. I’ve enjoyed the current one immensely, especially the beautiful photography. Felix, the sounds of wool was an awesome piece. Actually, “peace” was what I felt listening to it. Loved the sounds of yarn, and it was fun to hear the intro music again. I hope you’ll keep it around. Love the intro and the knit like the wind! It’s fantastic!! Please keep it and keep podcasting! I love to listen to you even when I’m just doing homework! I LOVE hearing the theme song again! It’s been great hearing your voice every week of late, the addition of ‘knit like the wind’ is the icing on the cake. Thanks for the reflections on gratitude, I love to count my blessings and I can tell ‘my two strong legs’ will be added to the count. And I really enjoyed the sounds of wool. I hadn’t thought before about the quietness of wool, maybe that’s another reason it relaxes me so much. Usually I knit while listening to Cast On, this time I was weaving and reflected on that sound of wool – the music of the loom, which, while not quiet, is a sound that that fills me with joy! I thought you didn’t need the theme music. I was convinced. The new Cast On, fresh start, all that. Then I heard it and got chills. Guess I didn’t know what was good for me. Now I’m glad it’s back. I think you need to keep the today’s sweater song, for when you have a finished sweater. I’d volunteer my next finished one, if you’re taking submissions. Personally, I like the intro ~ call me an Old Fashioned Girl, but it sets me up nicely in listening mode. And gives me a chance to ensure my volume for listening is adjusted right, before you begin speaking. Saves pesky rewind issues! I just wanted to say that I loved hearing the sheep noises. My partner came running into the room wanting to know what the bloody hell was going on!, & I had the pleasure of telling him that sheep actually DO make sounds & have feelings. It’s a good thing to be reminded of alternative perspectives, I think. Brenda, great podcast this week. I loved Felix’s piece about the sounds of wool. AND I was so glad to hear the Cast On theme – I’ve missed it! I also second Rebekkah’s comment on the Today’s Sweater song…. Hi Brenda, I was so happy to hear the theme music/intro!! on this weeks podcast!!! I associate it with all the pleasure I’ve had over the years listening to your excellent podcast. You are my absolute favorite podcaster and yes I would rather have you talk for 15 minutes than not at all, but what I’d really like is for an hour podcast every day. I know it’s not even remotely possible, but I love listening to you so much I just can’t get enough! You are extremely talented and such a joy to listen to!! Felix’s peice really made me think about the sounds of knitting and I came a similiar conclusion. 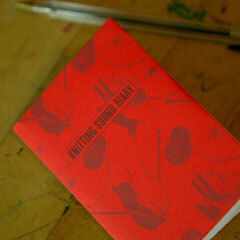 One big benefit of knitting is that it is a quiet activity and it allows me time to listen to the sounds around me. This was especially relaxing when vacationing near a river in Oregon. Also just wanted to know why so bummed about this year’s holidays? What has changed? Thanks again for your podcast!! This makes the end of a fabulous Thanksgiving weekend for me. Roast duck, mashed sweet potatoes, etc,. with my sweetie and his son. Friday at the Art Museum (and a mountain dulcimer concert) and a walk at the Arboretum. Saturday spent doing chores – including installing a ceiling fan in the kitchen. Sunday was a big brunch, saying goodbye to sweetie, then a wedding reception (gay friends who got legally married in NY last month), an hour on the phone with my best friend, baked “Pumpkin Cheesecake Muffins” for a co-worker’s birthday tomorrow – and the cherry on the sundae – a new Cast On! Life is good. And Brenda only makes it better! This was the first time I listened to your podcast, but I loved the intro song. I agree that it’s a great start to hearing your podcast. I think “knit like the wind” fits the sounds of wool too. Where I live, there is always wind, but like wool, you only hear it if you listen. Hope you had a great Thanksgiving and visit. 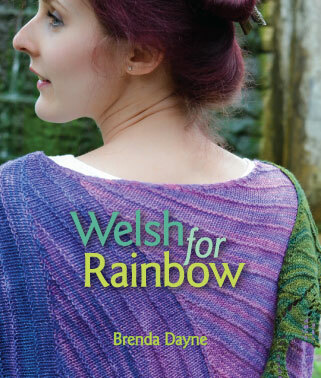 Looking forward to the next installment of Welsh for Rainbow! Thanks for podcasting! How thrilled was I to hear the theme song when I clicked to play the podcast today. I hadn’t really known WHAT was missing of the new format until I heard the theme song. It took me straight back to olden times and I thought “I must have clicked on the wrong episode” until I heard your lovely voice explain that it was a new addition to the new format. As someone else put it “it sets me up to listen”, it gets my attention and gets me excited about what you have to share. Having said that I don’t DISLIKE the new way, I merely prefer the old. As always, I find your anecdotes about knitting, holidays, creative and general topics interesting and thought provoking on really good days. You’ve made me wonder “what is in MY imaginary knitting bag?” and how do I feel about the occupy movement amongst my currently chaotic (moving house and life) daily experiences. Also I like that you haven’t cut out your music entirely, but clipped it to just one song. I think it’s manageable for you and, having a different taste in music than I, manageable for me too. Brenda, I vote for the theme song and the intro. When I hear the sheep and “knit like the wind” I know I am home with my knitting. I thought of you earlier this month as I made pumpkin scones and pumpkin muffins. Hope your feast was delightful. Thanks to Felix for sharing the sounds of knitting. I too feel very thankful to live an ordinary life which allows me to walk, work, knit and make a stab at writing. I love the theme song… keep it, it is adorable. Love the theme music, love the addi-turbo swish sound, love you Brenda, love the sheep and “knit like the wind” means all is good in the world. I am thankful for you, knitting and everything. Keep up the GREAT work. Brenda, yes the theme music is what let’s us know it is you. Well your voice too but the sound of the theme music just sets it up so you know to pull out your Addi Turbos and knit like the wind while listening to you. And the length of the podcast doesn’t matter. Although you have spoiled us for other podcasts. But would you please share the name of the coat pattern you are sewing? I would love to surprise my best friend with a sewing pattern for that coat. It sounds perfect for her. And now to go back to finishing a sweater that has been a UFO longer than I care to admit. It is going to be getting cold enough for a sweater soon. So glad the theme song is back. It’s so jaunty! I LOVE the intro and have missed it! Please do bring it back. Especially love the light saber sound for addi turbos and the sheep baa too! So glad to hear you regularly once again Brenda. Your voice is very soothing. 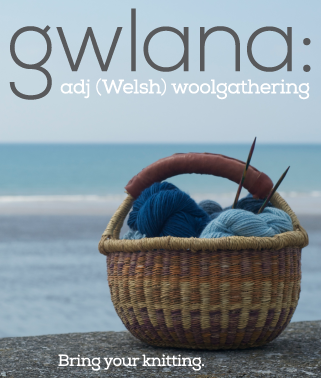 The sound of wool – great! Thanks! I have another sound of wool for you: the audio of a great sheep story called Three Bags Full (in English, “Glennkill” in German – much better!) by Leonie Swann. It’s a sheep detective story set in Ireland, from the sheep’s point-of-view, very funny and clever. Available not only in book form but also on audible.com (which I can’t get 🙁 ) in TWO different versions… as I only heard it in German, not sure which to recommend (Hugh Lee or Josephine Bailey). It’s listed on theaudiobookstore.com, too. Doesn’t seem available as an English language Kindle book, sadly. I have it on excellent authority that the translation is very, very good. It took a while for us bilinguals to work out that it had actually been written in German…!! There’s a second book for German readers, “Garou”, after the herd has moved to France… I can’t find any sign of this in English on the interwebs, which is a huge shame!! I loved Felix’s piece. I listened to this on my commute home after a long, long day, and it put be back into a serene, happy mood. Thank you! This is truly yoga for knitters. I love having you back podcasting again regularly. I’ve listened to each episode so excited to hear what you’ve been up to. BUT this episode when the theme music started my heart sang and I smiled because I evidently am one of Pavlov’s dogs and the music truly trumpets your arrival in my ears. Thank you for bringing it back. Loved the theme song back in the show! It’s like putting on my favorite sweatshirt, just a total ah feeling. Loved the Felix recording, when I heard the sheep I just burst out giggling. No idea why but it was probably my inner child just being silly. I was plying yarn on one of my spindles and it made me appreciate the different between the hum of my wheel versus the almost silence of the spindle. Very different experiences with no one is better than the other, just different. My thought is no theme music. I like your easy listening voice 🙂 But I can read that most like the theme music. What are you thinking about it? So happy to be listening to your podcast again. You have returned fresh and superb! Yay for the theme, yay for the whoosh, yay for the slogan! Sound-tastic podcast this time all round! Long live the intro song! I love that it’s back. And the soundscape that Felix put together for wool was so luscious. Thank s to you and her! Thank you for a great podcast this week. I particularly enjoyed Felix’s sound takes – how fascinating – the silence of wool – very soft and subtle, so, thank you to Felix too. I also loved the familiar old theme song – yes, it has been missed! I know you take a lot of time (even if it’s just in your head) putting these together and it shows. Thank you so much. These last few podcasts have also sent me scrambling to add books and music to my Christmas wish list as well. So, all your hard work will hopefully bear fruit for both your bank account and my Christmas tree as well! Wishing you a restful and happy holiday season – chestnut flour crusts and all. That theme song is sets just the right jaunty tone and it’s your trademark. Please keep it around. You know, feeling blue isn’t a waste. It’s like the dark contrast wool in a stranded mitten. It makes the brights shine. Strive for balance. Enjoy a good wallow in the blues as much as your shining happy moments. Together they make a beautiful life. Please please please keep the music and the knit like the wind opening – it’s comfortingly familiar, and good! Also, loved the knitting sounds part at the end. It’s stayed with me all day at work, dreaming of the sounds of wool. Yes to the theme song. When it started playing I realized I’d been missing it. My heart skipped a beat in excitement when I heard the opening theme song. 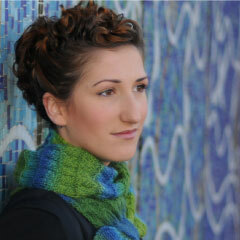 I love everything about that “Knit like the wind” music…especially the sheep. I vote yes!